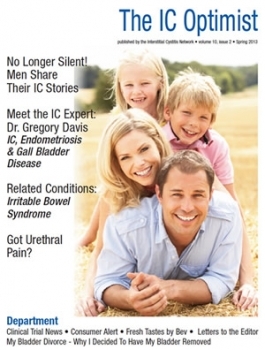 Interstitial Cystitis (IC/BPS) affects men of all ages, from high school students to seniors, air force pilots to Hollywood actors. Many, if not most, have been diagnosed with chronic prostatitis, often for years, before they receive a correct diagnosis. You might also be surprised to learn that IC/BPS has been tracked in high numbers in active duty military personnel returning from Iraq & Afghanistan. This captures the dilemma confronting many men, the mistaken belief that urinary problems are the result of prostate dysfunction. Many physicians simply do not consider nor go beyond the prostate to examine the health of the bladder. The new AUA Diagnostic & Treatment Guidelines is, hopefully, correcting this! 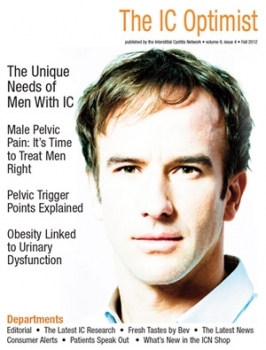 The diagnosis of men with IC/BPS is very similar to women with the exception of eliminating potential prostate conditions that can mimic the symptoms of IC. Thus, men will also have a prostate exam and may have prostate secretions cultured. A pelvic floor assessment should always be performed to rule out pelvic floor dysfunction and/or painful trigger points. Like women, men with interstitial cystitis can experience tense, painful muscles in the pelvis which can create a variety of bladder symptoms. This commonly occurs in men who ride bicycles, motorcycles and/or who sit for long periods of time. An accident or injury can trigger pelvic floor tension. This simple test can be performed by a urologist or trained physical therapist. The standard treatments as listed in the AUA Treatment guidelines apply. Please read these here! Please review the extensive self help section of this website for tools that can help you not only avoid triggers but improve your long term general health. Diet modification, for example, is a critical factor and recommended in Step One of the AUA Treatment Guidelines. It’s not unusual for men to suffer in silence, without sharing their struggles with family members and/or friends and we need to urge you NOT to do this. Research has shown that men who receive and have the support of their spouses, family members and friends have better outcomes then men who don’t. If you’re in pain, you need to share that you are in pain and ask for help. After all, wouldn’t you help your wife if she were in pain? Then why not let her help you! Any injury, illness and pain can and will take an emotional toll on even the strongest of people. I want to remind you that you have done nothing wrong. You do not deserve to suffer, nor are you a lesser person because you are struggling. In fact, I’m going to argue that you will become stronger, wiser and, over the long term, a much more compassionate and caring family member and friend. One place that you can receive support is right here on this website in the ICN Support Forum, where you’ll an opportunity to meet other men who also share your diagnosis. Men with IC/BPS learn that, with some minor accommodation, their careers should continue to prosper. There are, however, some obstacles that need to be addressed. The jarring sensation that occurs with driving can irritate the bladder and trigger frequency and/or pain. If you commute to work, we strongly suggest that you use a car with a very smooth suspension. The bouncier the suspension, the more challenging the symptoms. In our experience, the larger American cars are the most comfortable. Seats should also be comfortable. When ICN President Jill Osborne spent a year testing cars, she absolutely loved the smooth ride of the Volvo’s but the car seats were hard leather with little padding and pain occurred just a few minutes into the test drive. Leather seats found in many foreign cars (i.e. Toyotas, Hondas, etc.) tend to be harder and more uncomfortable. Fabric seats are usually much more comfortable. If you’re riding a bus or train, you might find our Bladder & Prostate Friendly Chair Cushion very helpful. Plan for emergencies. If you’re worried about getting stuck on the freeway there are many products that you can use if you need “to go.” Afterall, small aircraft pilots use them… so why not you! TravelJohns offers portable urinals for both men and women that have a chemical added which solidifies urine so that it can not leak out of the bag. It is neat, tidy, disposable in any trashcan and very useful in a crisis! Under no circumstance should an IC patient drive while taking strong pain medications. You risk not only your health, but those of other drivers by driving impaired. If pain is an issue, consider using a TENS unit in your car until you get home. You can even try gently slapping your thigh which, like a TENS unit, helps distract the brain from the pain. A heating pad can also be very helpful in taking the edge off. BodiHeat adhesive pads are perfect for driving because they deliver constant steady heat and can be worn in the car, at work and on planes. Just stick to your tee shirt or jockeys and go! If you’re sitting all day, take note of your chair. Office chairs should be fairly cushy so as not to put undue pressure on the muscles in your buttocks. If you can’t tolerate anything touching your crotch area, consider purchasing the Pelvic Friendly Chair Cushion. It is a square cushion that has a groove down the middle, thus removing all pressure in that area. You might be surprised to learn that these cushions have even been used in the cockpit of F-18 fighters with great success. Please note that circular “donut” cushions rarely work because they put far too much unnatural pressure on the pelvic floor muscles. Meetings present a special challenge, particularly if you’re not wanting others to know of your IC. If you need to be in meetings for a long period of time, don’t start your day with coffees, OJ or sodas, which can increase your need to urinate dramatically. Some medications can help reduce that superficial bladder irritation, like pyridium. Other medications may help reduce that urgency sensation, including Detrol or Ditropan. Ultimately, though, if you’ve gotta go, just go. Don’t hold your urine for long periods of time when you’re in pain because that urine is irritating your bladder and creating yet more irritation. For travellers, the first item in your arsenal should be a restroom access card so that you can request assistance, particularly when flying. Some patients carry medalert cards that state ‘Interstitial cystitis: Restroom Access Required.” Request seats nearest the restroom and when boarding the plane, introduce yourself to the flight attendant and inform them that you do have bladder problem and may need to use the restroom frequently. Flying business or first class is ideal because they have their own restrooms and often more accomodating flight attendants.